Does speaking out against Israel by default equate to anti-semitism? Does speaking out against the Israeli government mean you are by default an anti-semite? I have been asking myself that question for more than two decades since finishing five years at a Jewish high school in 1991 where the idea of Israel’s saintliness was drummed into mine and my classmates’ heads with the force of an animal stun gun. The question resurfaces every time someone of generally high standing is accused of being anti-semitic. The latest in the firing line is Sydney University professor, Jake Lynch. Professor Lynch is director of Sydney University’s Centre for Peace and Conflict Studies, and author of a number of academic works on “peace journalism”. By his association with the Boycott, Divestment and Sanctions (BDS) campaign, professor Lynch has been accused of being “against jewish people” by shadow foreign affairs spokeswoman Julie Bishop, who has promised that should the Coalition win government, it would cut funding from the Centre for Peace and Conflict Studies. “Mr Lynch is free to raise funds from non-government sources if he requires money to fund his campaign against the state of Israel and Jewish people,” Julie Bishop told The Australian. “A Coalition government would seek to withdraw funding to any academic institution that used taxpayer funds for an anti-semitic campaign,” she adds. Bishop, who is not Jewish, makes the familiar leap from it being “a campaign against “Israel” to “against the Jewish people”. Now, I for one do not support the boycott being promoted by the BDS campaign. But it seems highly questionable that professor Lynch is “against the Jews” given his CV, academic credentials, published works and experience. He has written for the respected independent online journal New Matilda and appeared on the ABC opinion program The Drum. In addition, three Jewish academics have come out in support of professor Lynch’s and other people’s or organisations’ democratic rights to be critical of Israeli policies and actions without the threat of losing their funding. “Andrew Benjamin, Michele Grossman and David Goodman variously described the policy outlined last week by Liberal deputy leader Julie Bishop as ‘outrageous’, ‘counter-productive’, ‘populist’, and as ‘an anti-democratic gesture par excellence,” reported The Australian. (For professor Lynch’s own explanation for why he supports the BDS campaign, read his view on New Matilda – interestingly, the word “Jew” or “Jewish” is not said once). A look back through the archives reveals other similar examples where left-wing leaning people and organisations have been labelled ‘anti-semitic” for speaking their minds on Israeli politics. In September 2010, Fairfax journalist and broadcaster Mike Carlton came under fire for an article he had written highly critical of the actions of Israeli forces in Gaza in May 2010. In a follow up column a week later, he wrote of the hundreds of angry emails he had received in response from the Jewish lobby, which he called a “ferocious beast”. “Write just one sentence even mildly critical of Israel and it lunges from its lair, fangs bared, ” said Carlton. “I replied to Robert Goot (president of the Executive Council of Australian Jewry) ,that I am perfectly content with the existence of Israel as an independent Jewish homeland, and that I have no more regard for Hamas than I had for the psychopaths of my own ethnic background, the IRA. A complaint of anti-semitism made against Carlton was dismissed by the Australian Press Council. Last year Nobel prize-winning author Gunter Grass was labelled an anti-semite for a poem he wrote arguing against Germany delivering nuclear submarines to Israel. For someone who grew up being told not to buy German cars or German appliances (though every parent of every kid I new at school drove a BMW or Mercedes), the ironies are too huge to even try to put in words. And also last year, the Executive Council of Australian Jewry sought to halt promotion and DVD sales of the SBS series ‘The Promise’ about a young British woman retracing the footsteps of her grandfather, a soldier in the final years of the British Mandate in Palestine, labelling it Nazi propaganda and anti-semitic. The truth, it seems, is that criticism of Israeli government policies inevitably leads to the cries that there is an underlying anti-Jewish agenda. And it doesn’t even matter if you’re a Jew. If you’re a Jew and you criticise Israel, then you are a “Jew-hating Jew”. The most high-profile example of this was South African Judge Richard Goldstone, who chaired the Goldstone Commission in The Hague prosecuting war crimes in Yugoslavia and Rwanda and released the controversial Goldstone Report. He felt the full wrath of the small, but highly influential South African Jewish community, when the Goldstone report into the Gaza war of December 2008 and January 2009 was published, accusing the Israeli government, but also Hamas, of deliberately targeting civilians. The backlash in South Africa was brutal and vindictive, aimed at inflicting maximum personal hurt and pain. Leading the charge was the South African Zionist Federation, who threatened to picket the synagogue if Goldstone attended his own grandson’s bar mitzvah in Johannesburg. As someone who remembers the importance of his own bar mitzvah (when you symbolically enter adulthood at age 13), it was the cruellest of threats. In April 2011, Richard Goldstone wrote in the Washington Post that subsequent findings were that the Israeli government had not intentionally targeted civilians but also that “the purpose of the Goldstone Report was never to prove a foregone conclusion against Israel”. To any sane individual, Richard Goldstone is not anti-semite. But not to the South African Zionist lobby – a lobby I might point out is content to live outside of Israel – rather than join in those who actually live there day in and day out. I can understand though where such views germinate from. I spent five years at a Jewish day school in South Africa where the idea of Israel’s importance was heavily and relentlessly drummed into our heads, while at the same time no mention was made of our own privileged positions as white school kids in a private school in apartheid South Africa. We had one particular history teacher, a very severe woman, who instructed us to learn to draw the Israeli map from memory. I am not joking – Heaven forbid you could not manage the task! Later, in adult life, I have found myself at dinner parties and where I have been told that institutions like the BBC and The Guardian newspaper – among the most respected media organisations in the world – are anti-semitic. Instead, I was told to watch CNN for an unbiased (read: pro-Israeli) point of view. So am I suggesting the BDS campaign is an entirely kosher operation with no bad elements tagged on to it. Certainly not, that would be naive. But equally, is it fair to tar anyone who forms a negative view on Israeli government policies as an anti-semite? Like every government, the Israeli government is far from perfect. Anyone who has followed the story of Mossad’s use of fake Australian and British passports to carry out a Hamas hit in January 2010 will know that there are some very sinister elements operating within the darker recesses of the Israeli government. As there are in every government. The funny thing is that within Israel, Jews protest openly against Israeli policies such as when 250,000 Israelis joined rallies against their government’s economic policies in September 2011 – and no one accuses them of being jew-hating jews. Surely the time has come to separate legitimate criticism of Israel with claims of anti-semitism. Yes there are many anti-semitic agendas behind Israeli protests and anti-Israeli comments and these should be pointed out when the evidence overwhelmingly says so. But jumping up hysterically and shouting “anti-semite” every time a word is uttered in anger serves no purpose but to give more ammunition to the real bigots and jew-haters. 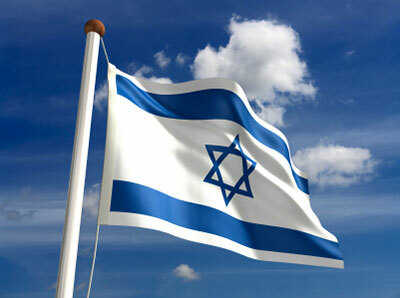 Israel holds itself up as an example of a democracy surrounding by states that are not. Surely it’s time its defenders in the diaspora became a little more tolerant of free speech. There can surely be two no more disparate accounts of Ireland than Pete McCarthy’s meandering travelogue ‘McCarthy’s Bar’ and Frank McCourt’s classic memoir of a miserable childhood, ‘Angela’s Ashes’. I read both books one after the other. ‘Angela’s Ashes’ won Frank McCourt the Pulitzer Prize while ‘McCarthy’s Bar’ won Peter McCarthy – already a successful television host of travel programs – a legion of new fans. Both made me laugh out loud as I read them on the train into work (as well as feel cringeful, sad and nostalgic). They made me want to undertake my own Irish adventure, a place I have visited only once. It was in 1990, when I was just 16 and Germany had won the World Cup (I remember a hand-written sign at Heathrow as we disembarked: Germany 1 – Argentina 0) when my family went there as part of a three-week UK and Ireland holiday. We visited my Great Aunt Bertha and her husband, my Great Uncle Jack Weingreen, the only relative I know who gets a mention on Wikipedia. Professor Jacob Weingreen (c. 1907 – April 11, 1995) was a professor of Hebrew in Trinity College, Dublin – School of religion and theology between 1939 and 1979. He excavated in Samaria and maintained contact with archaeologists who donated pieces to the Weingreen museum which was named after him. Professor Weingreen was the author of the Hebrew grammar textbook that is still recognized as the standard teaching work on the subject. Bertha came from South Africa where she taught English and Drama at a training college for ‘coloured’ teachers. 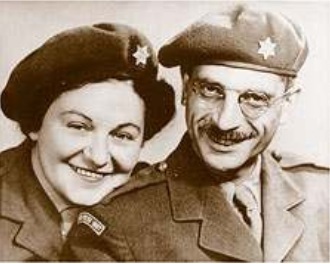 In 1945, Jack and Bertha joined the Jewish Relief Unit which cared for the remnants of European Jewry who had survived the Nazi concentration camps. Bertha was Chief Welfare Officer responsible for all Jewish DPs (Displaced Persons) in the British Zone, and was stationed at the former military barracks at Bergen-Belsen. Reading Angela’s Ashes and McCarthy’s Bar, stirred up memories of our family visit to Ireland to see Jack and Bertha, when both were in their eighties and in the twilight years of their lives. Ireland felt poor in 1990, but not as poor as it did for Frank McCourt. 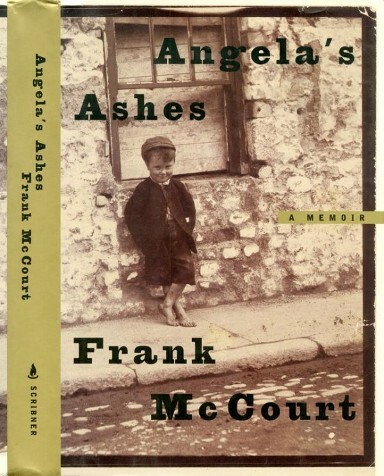 Most of Angela’s Ashes (published 1996) is set in the poorest backwater lanes of Limerick, where the McCourt family lived in a squalid two-storey hovel in the 1940s. In winter, the ground floor would flood, so the family lived upstairs, which they called ‘Italy’ with a fireplace that kept them warm, surviving on fried bread and tea. 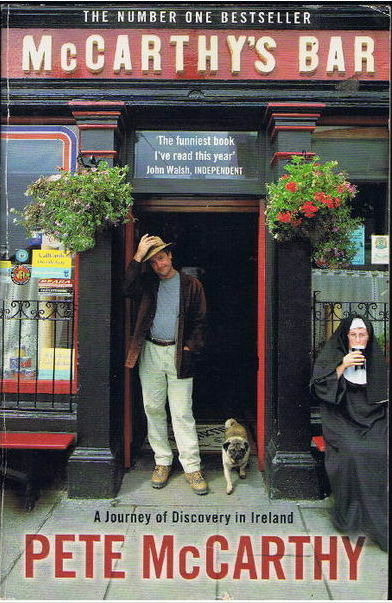 In ‘McCarthy’s Bar’ (published in 2000) Pete McCarthy journeys around Ireland in a beat-up blue Volvo he nicknames ‘The Tank’ observing the eighth rule of travel: ‘Never pass a bar that has your name on it’ while he ponders his identity (over a Guinness). With an Irish mother but an English father and memories of family holidays in Drimoleague, in county Cork, he tries to understand his strong sense of Irishness and whether he claim membership of the Irish race. I also felt, growing up, that I could claim some part of Ireland for myself and recall often wearing a T-shirt with words emblazoned in emerald-green on the front: “I have Irish roots”, the letters decorated with leaves and roots and somewhere, I imagine, a four-leaf clover. I loved telling anyone who would listen, that my Great Uncle Jack Weingreen wrote the definitive text-book on Hebrew Grammar. In fact, we had a copy of the textbook at home, should anyone question the legitimacy of my claims. Ironically, I was terrible at Hebrew at school, despite five years of conjugations and the implorings of my Israeli hebrew teachers, I can only remember a phrase or two. In 1946, while Bertha and Jack were helping holocaust survivors rebuild their lives after the horrors of the war, Frank McCourt, aged just 16, was working as a delivery boy at Easons, delivering newspapers and magazines around Limerick. He’d survived a bout of diphtheria that almost claimed his life, an extreme case of conjunctivitis that almost took his eye sight, an alcoholic father who drank what little money they had before disappearing to England, the loss of three siblings and the shame of watching his mother beg for food to keep her children from starving. A few years later he would set sail for America and begin a new life, before writing his memoirs many years later. When we visited Jack and Bertha at their home in Dublin, they were old, but charming and kind. Jack I remember as an older version of the army photo: a stooped, small, man with a moustache and glasses, always in a tie and tweed jacket who made us soup with kneidelach (dumplings). He smoked a pipe and snorted a lot, which made all of us laugh uncontrollably. My memories of Bertha are less clear, though I remember large kind eyes. We slept on the floor of their cluttered house, filled with the things they had accumulated from lives lived to the full. They had a long, rambling garden, grown wild and unruly. It had once, according to my grandmother Nella (Bertha’s sister) been a stunning, colourful garden that had won prizes and been featured in magazines. We visited Trinity college with Uncle Jack, who proudly showed us round his alma mater and I remember eating a distinctly awful and drap lunch in a gloomy cafeteria. In 1990 Ireland felt poor. The emergence of the “Celtic” tiger economy of Pete McCarthy’s travelogue (where Singapore noodles cost more than “in a Chinese shop off Leicester Square”) was five years away. I remember we visiting a friend of my mother’s, who lived in a very rundown house with bicycles and other things scattered in an overgrown backyard. There are, it turns out, a lot of bars in Ireland called ‘McCarthy’s Bar’ and Pete McCarthy duly spends much of the book in pubs all across Ireland drinking Guinness and whiskey with the locals (some of whom are German and English expats) often accompanied by a toasted ham and cheese sandwich, reading excerpts from a 19th century travel journal – Irish Sketches – by William Makepeace Thackeray and pondering his identity with long-lost friends and relatives, drunks, bar tenders and tourists. He travels through Ireland describing mountains of “biblical ruggedness” where bearded men “play harps”, remote islands reached by rickety cable cars, fields of green divided by stone walls where farm animals graze. He visits ancient standing stones and ruined medieval churches and abbeys, uncovers the tourist trappings in overpriced Killarney bed and breakfasts, shares a pint with Jimi Hendrix’s semi-retired bass guitarist Noel Redding, but doesn’t run into U2 guitarist ‘The Edge in Cong. Finally he finds himself after countless adventures and misadventures in Lough Dergh in County Donegal, where he undertakes the 1,000 year old Christian pilgrimage, a three-day marathon of praying, walking, fasting and circling. My own family Irish adventure culminated in an “Oirish” castle, where we stayed for a few days courtesy of a ‘Timeshare’ swap and which would have amused Pete McCarthy. It had an indoor swimming pool and the towers and crenallations of a castle, but that is all I remember. It is the kind of holiday Frank McCourt could only have dreamed of. For the McCourt’s Christmas meant Frank going out with his brother Malachy in their threadbare clothes in the freezing Irish winter to hunt for coal discarded on the road so they could have enough fuel to start a fire and enjoy a Christmas dinner of boiled pig’s head and floury potatoes and tea. My Great Uncle Jack and Aunt Bertha played an active role in Irish academic life and Dublin’s small jewish community for almost fifty years. Jack died in 1995 and Berth in 1999. Our family holiday is my only memories of them. Frank McCourt and Pete McCarthy have also both departed, both sadly from cancer. Peter McCarthy died in 2004, aged just 53 and Frank McCourt at 78 in 2008. Their paths crossed briefly in 1998, while Frank McCourt was touring the world to promote Angela’s Ashes and while Pete McCarthy was travelling around Ireland in his blue Volvo on his own personal pilgrimage of identity. McCarthy gave a ride to a Canadian hitch-hiker who said she was going to Castlebar in County Mayo to a “library to listen to a writer”. It turned out to be Frank McCourt. McCarthy describes Frank McCourt as wearing s a blue jacket, red shirt and looking much younger than his sixty-nine years. He plucks up the courage to ask McCourt a question. “Where do you feel you belong?” McCarthy asks. “New York” Frank McCourt replies. But before McCarthy can ask him if its possible to “truly belong in a land where you’ve never actually live” the talk is over. Later, while Peter McCarthy is eating a very good and cheap meal of Singaporean noodles (the bill comes to a reasonable £12), Frank McCourt walks past the window. They say the retailing environment is tough at the moment. The online world with its free shipping, discounts and gimmicks is really biting into “bricks and mortar” shops selling books, CDs, DVD and just about anything else you don’t have to eat or drink. Who would have thought that so many Australian consumers – men and women- would be buying entire wardrobes online? But they are. Companies like UK-based fashion house ASOS are selling so much merchandise to Australians they’re having to fly in two jumbo jets a week just to fit everything in. This week, amid this tough retailing environment, a complete stranger did me a favour. I was in an ‘All Books 4 Less’, one of those discount stores that sells books for $5 and $10. I picked out a book for my wife as a present. It was a nice book on crafts. I walked up to the register and nice young woman scanned the book and told me it was $10. I took out my wallet and handed her my debit card. “Minimum EFTPOS transaction is $15” it read. I shook my head and scrounged around in my wallet for a $5 note. Then I emptied out my front pockets and my back pockets and came up with a few dollars more. She stared at me, smiling awkwardly, as I scrounged around in my bag for coins. I laid everything out on the table and counted. Surely she would not begrudge me 5 cents? I glared back at her. Indignant. Then I searched again in my bag and then in all the pockets of my jeans and then in my wallet. “You’re being ridiculous,” I told her, the anger rising. She suggested I walk to the nearest bank. I searched through my bag, my pockets, my wallet again, refusing to move. “Perhaps you can buy another book so you spend $15?” she suggested. “I don’t want another book,” I replied. Then a woman came up behind me to pay for some books. I told her why I was standing at the counter with the contents of my bag spread out before me. ‘You wouldn’t have 5 cents would you?” I asked her. She smiled, opened her purse and took out a 5 cent piece and gave it to me. I gave it to the woman behind the counter. I left with my book. Reflecting back now on this, I have to ask: Has the retailing world gone mad? Is this how you treat customers when you’re competitors are selling the same products at half the price? But it seems it has. There’s the story about the health food store in Brisbane charging customers $5 “to browse” because the owner was apparently unhappy with giving customers advice, without the guarantee they would buy anything. This is not an isolated innocent. In Newcastle (NSW), a shoe shop is charging customers $10 to try on shoes. In both cases, the money is deducted if the customer makes a purchase, but who would bother putting up with this kind of attitude? Half the fun of shopping is the ability to browse. And is this the best solution these two businesses can come up with to arrest revenue lost to online stores or cheaper competitors? Smacks of desperation. These businesses won’t last very long. Such contempt for customers is happening at the top of the retail food chain as well. Recently Myer managing director Bernie Brooks, suggested it would not be a good idea for taxpayers to fund the national disability insurance scheme (NDIS) because it would cut into the money people may spend in his department stores. The social media backlash was brutal. And let’s not forget another grumpy old retailer, Gerry Harvey, founder of Harvey Norman, worth close to a billion dollars, who loves to complain about online retailers stealing his business, Then he launched his own own online store. Of course he is still loves running those “23 month no interest, no deposit, no repayment” dodgy offers that cost unwary customers hundreds of dollars in extra fees and other costs. The fact is there are plenty of traditional retailers making good money because they know how to sell their products, sell the right kind of products and because they treat the customer as king. This is just as true in the de-personalised online world, where for example the Book Depository charges no shipping fees at all even for international purchases. So here’s a suggestion for the people at All Books 4 Less and every other retailer grumbling and looking to gouge their customers, even for a measly 5 cents. Don’t argue with us. Don’t try and wrestle our money from us. Treat us like old friends. Make us smile and we’ll keep coming back. 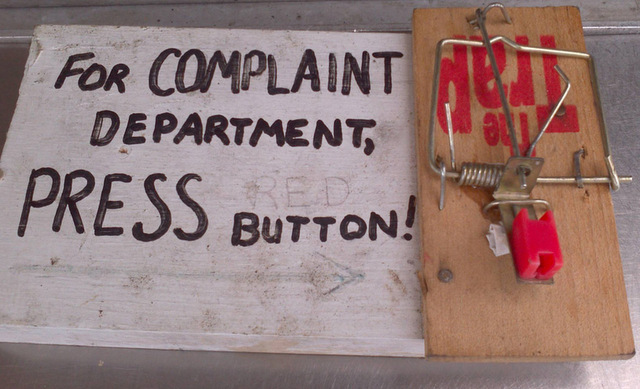 And remember that old saying: the customer is always right. It’s been six months since the government hit big tobacco companies where it really hurt them – their brands. A little while ago, needing a few groceries, I drove up to the local store, parked the car, dashed in from the rain, grabbed a few items from the shelves and headed for the counter to find myself staring inside a veritable cabinet of horrors. It was the kind of scene that would, were it broadcast on the news, come with a warning: “The following graphic imagery may disturb sensitive viewers. Viewer discretion advised”. But what choice did I have other than to look? Behind the head of the little Asian man serving me were images of diseased and blackened limbs, a cancerous, dissected lung, an eye socket prized open like a scene from the movie ‘A Clockwork Orange’, and an emaciated man dying in a bed. All of these images were on the covers of cigarette packs stacked up in what looked like a white medicine cabinet, the doors flung open. Instead of medicine though, it’s death that’s up for sale. These graphic, nausea-inducing images are to be found everywhere on billboards, in bus shelters, in print and online advertising,on the government’s department of health and ageing website, and in discarded cigarette packs on suburban streets. 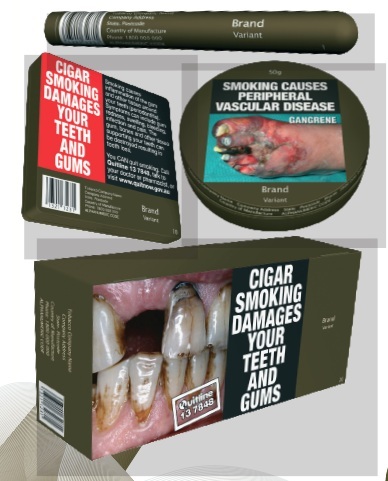 “All tobacco products sold, offered for sale or otherwise supplied in Australia must be in plain packaging and be labelled with the new and expanded health warnings”. Just why the government has called its legislation “plain packaging” when it’s quite the opposite is probably the reason I’m a journalist and not a politician. 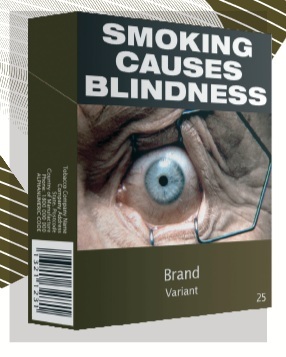 The idea behind plain packaging is to prevent the misleading advertising of tobacco products with images and words aimed at discouraging new smokers from taking up the habit and convincing those who currently smoke to quit. According to the government, an estimated 15,000 Australians die every year from smoking-related disease, costing the Australian economy and society approximately $31.5 billion a year. It’s the government’s key strategy in a very bitter battle against the tobacco industry alongside a raft of other measures that include a 25% tobacco excise increase in April 2010, more than $85 million spent on anti-smoking social marketing campaigns and legislation to restrict internet advertising of tobacco products. That’s fair enough and commendable. But what about those of us who don’t smoke? What about our rights to enjoy a pleasant afternoon in the convenience store without being visually assaulted by images of a blackened, gangrenous foot or a spliced open, diseased pair of lungs? More importantly are these graphic images really necessary and do they actually work? The government says “branding and packaging designs on tobacco products can mislead consumers” (who can forget the Marlboro Man?) but is there any evidence that these images are discouraging anyone from giving up or starting to smoke? That answer won’t be known for a number of years since Australia is the first country to implement this policy, though according to anti-smoking campaigner Anne Jones, chief executive of Action on Smoking and Health, there are “130 published research studies showing that young people perceive tobacco in plain packs to be less appealing, less palatable and of lower quality”. And what about the advertising of two other major social ills: alcohol and gambling? Why have they gotten off so easily? Clearly there is a difference between alcohol and gambling…and smoking. Smoking is bad, period, but having a flutter on the horses or a glass or two of vino is not going to do any major damage. But when either drinking or gambling are done excessively, the effects are just as damaging as smoking; indeed while smoking is usually a gradual decent into ill-health, a night of heavy drinking or one spent in front of a pokie machine can ruin a life in a very short time. And while the proportion of people who drink excessively has hardly fallen in recent year – around one in five according to the most Australian Bureau of Statistics figures – smoking rates are going in the opposite direction, before plain packaging rules were enforced. An article in The Age published in November last year reported that about 16.3% of adults smoked daily in 2011-12, well down from 2001 rates of 22.4%. Indeed, smoking rates have fallen been for decades, with figures from Quit Australia showing that the smoking rate was 72% in males in 1945, 40% in 1980 and 25% in 2001. And yet what do we get: a grotesque anti-tobacco campaign on the one hand, but on the other, ad after ad on the television, radio, print and online promoting beer, wine and spirits, while the pubs and clubs are stacked full with pokie machines and hundreds of millions of dollars are spent on new 24 hour casinos. 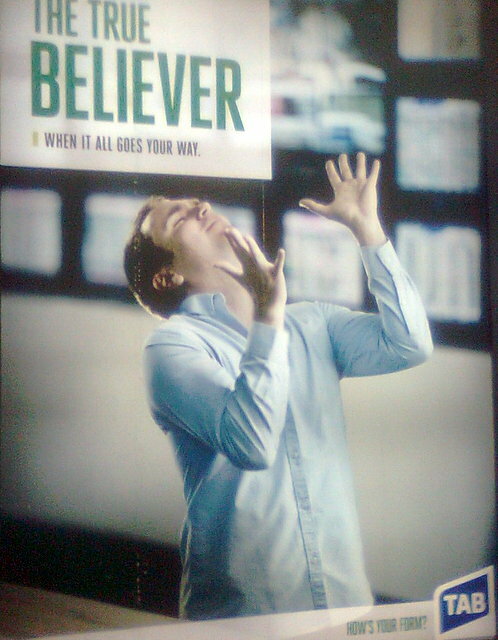 There’s even giant ads courtesy of TAB extolling the virtues of winning at gambling (the one below in Southern Cross train station) and a smug Tom Waterhouse in his suits saying its cool to have bet after bet after bet. In contrast, cigarette advertising has been banned on Australian television since 1974 and in sports since 1992 (with a stay of execution granted to Formula One racing until 2006). The government trumps its victory over big tobacco, but alcoholic beverage makers and the casino operators and bookies get a virtual free ride. Perhaps they’re funding election campaigns, who knows? But non-smokers like me, the vast majority of the population, not only have to put up with beer gardens and outdoor cafes packed with smokers, but the graphic images that assault the senses. And let me ask you this question: have you ever actually heard of anyone quitting smoking because of the images and warnings on the packs? All I see is smokers happily taking cigarettes from their “plain” packs, lighting up and puffing away while I get to ‘enjoy’ the image of a foot gone black with gangrene while I do my shopping. But perhaps, I’ve got it all wrong. Maybe, the real reason behind plain packaging campaign is not about smoking at all, but aimed at tackling another chronic issue in Australia: obesity. In that regard, it will probably work a treat! For the four-and-a-half years I lived in London, The Guardian was the newspaper to read for quality investigative journalism as well as for its famous spelling mistake howlers. Writing for Accountancy Age magazine in Soho, I’d read the business sections of The Guardian, alongside the other broadsheets (the Financial Times, The Independent and Daily Telegraph) for possible story ideas in the morning and then, like everyone else, would seek out The Sun and The Mirror in the afternoon for the salacious gossip, page 3 girls and Premier League football stories. 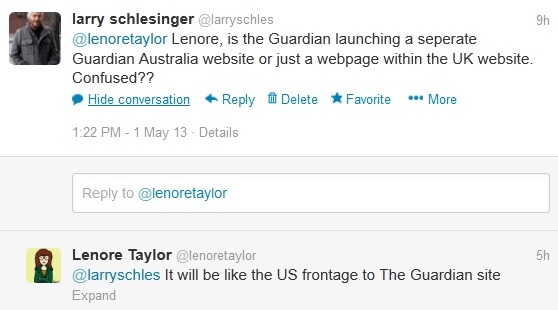 Lately there has been extensive coverage of the launch of a digital Australian edition of The Guardian (announced in January) with news of top Fairfax journalists like David Marr and Lenore Taylor jumping on board with the site to be edited by The Guardian’s deputy editor Katharine Viner. A colleague of mine at Private Media, Oliver Milman, will be joining the Guardian Australia as a Melbourne-based environment reporter alongside other new signings of journalistic talent announced this week. They’ve already leased offices for journalists and other staff in Surry Hills, Sydney, so it’s clearly a serious venture for a publication, which is the fourth biggest newspaper website in the world with a monthly audience of 30.8 million users behind Mail Online (45.3m monthly readers), the NY Times‘s (44.8m) and USA Today (34.6m) according to National Readership Surveys September 2012 figures. So, eager to find out more, I searched for ‘The Guardian Australia‘ on Google. 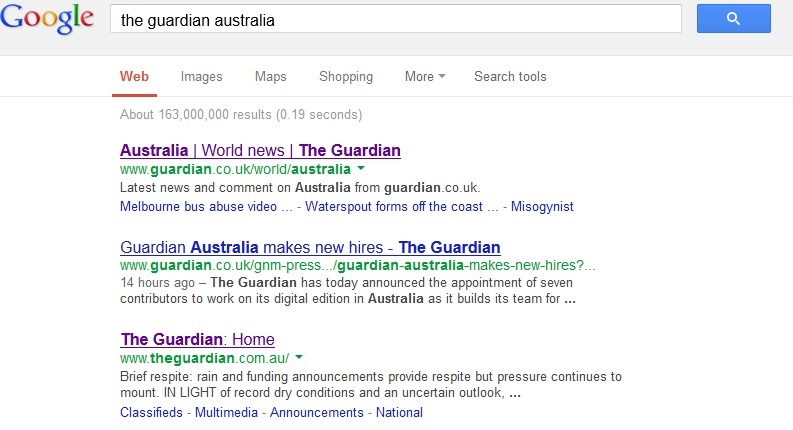 So I clicked on the third link on my Google search – www.theguardian.com.au which sounded like the most likely address for the new digital Guardian Australia edition. And bingo, I came across a newspaper website full of Australian stories with a masthead in similar font to that used by The Guardian. So was this The Guardian Australia edition? Clearly not, since it says its owned by Fairfax. This is another Guardian Australia – a regional newspaper dating back to 1888. Perhaps its only coincidence the fonts are so similar, but it surely must have caught the attention of those in corridors of power at Fairfax, and not just because they’ve got the URL, but also the Facebook address: www.facebook.com/GuardianAU. “Frontage” – is a new term I’d never heard before, but I assumed it meant something on The Guardian‘s front page, so that’s where I went. 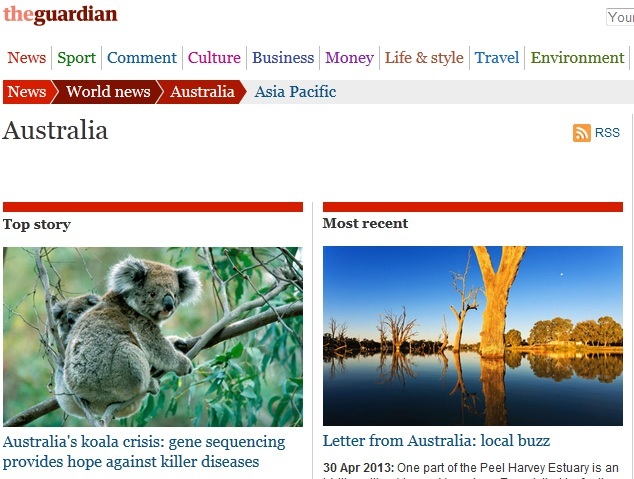 Website address issues aside, it’s going to be interesting to see how The Guardian performs in Australia. As someone pointed out to me, it’s going to go from being a UK publication writing about Australia for British readers to one written by Australians for Australian readers, with a UK editor. This it has done somewhat successfully with its US edition, which now has around 8 million viewers a month. 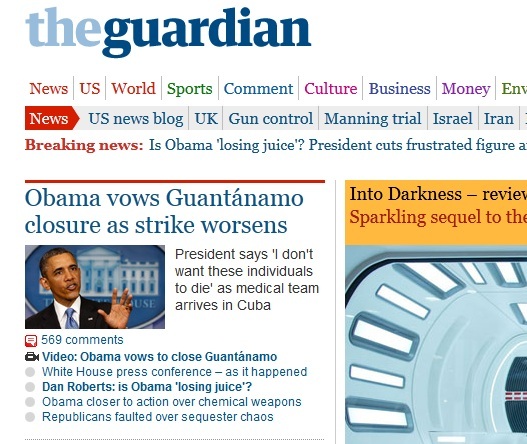 But it’s been a bumpy ride for The Guardian US, which first launched in 2007 as GuardianAmerica.com, then folded back into the UK edition in 2009, with staff laid off, before launching its US edition (or ‘frontage’ to use Lenore Taylor’s term) in September last year, also accessible via the URL: http://www.guardiannews.com. While no doubt the journalism produced by The Guardian Australia will be of the highest calibre, it will face challenges from a host of established left-wing publications like Crikey.com.au, The Global Mail (founded no less than by BRW Rich Lister Graeme Wood, the primary investor in The Guardian Australia), the ABC’s online presence and Fairfax’s own stable of publications, to name just a few. 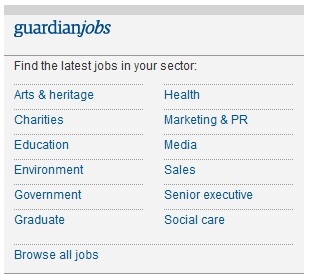 Which means making money from The Guardian Australia will be an even bigger challenge. 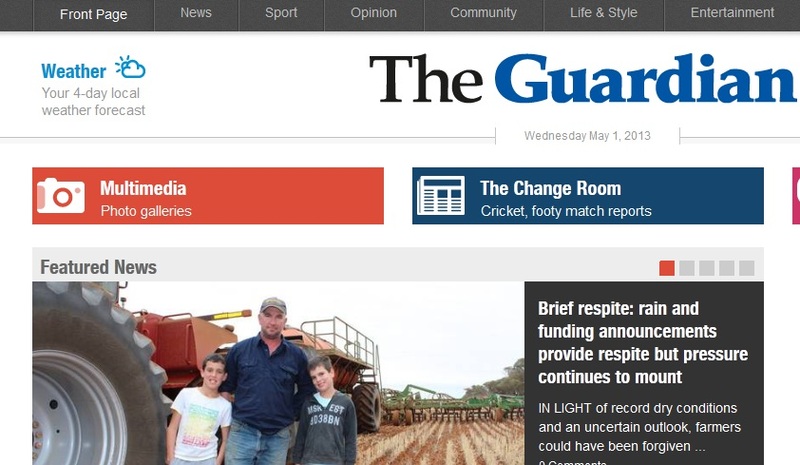 The Guardian Media group has been the exact opposite of a cash cow of late reporting huge losses in recent years (£75 million loss in the 12 months to August 2012) as it tries to transition its business model to one that taps into its huge online audience, a difficult task that neither Fairfax nor News Limited nor any media organisation have yet fully realised. And it has another challenge. As Crikey writer Guy Rundle pointed out, The Guardian has a reputation for being the worst of the UK newspapers when it comes to writing stores with an anti-Australia slant. It’s reporting on the Ashes and British Lions tours later this year will be fascinating to say the least – if you can find the website!